Don't let them take advantage of you! “An educated consumer is the best defense against known locksmith scams. Together we can defeat these unethical scam locksmith companies! The following are known locksmith scams that have been going on for about 30 years or so. We sincerely hope that the general public will look at this page and pass on the knowledge to as many people as possible. While the amount of illegitimate/scam locksmith companies in Colorado has decreased substantially over the years, there are still too many of them. The good news is that this decrease is due, in no small part, to Colorado citizens being ‘educated’ on what the specific scams are – and how they work. Most of the scam listings/companies are foreign-based and foreign owned. You think you are calling a local company, but most are call centers in New York. Most of the ‘technicians’ have little-to-no training in locksmithing. The training that they do have consists of ‘how-to techniques’ in rip-off tactics. You have just been ripped off, and you don’t even know it. By the time your locksmith technician arrives, he/she will charge you as much as he/she can get. The typical price is $149. Not the $40 you think you will pay. You are now angry and frustrated. You have waited a long time (despite the fact that the rep quoted you only about a 20 minute wait time) and you were expecting to pay about $40. More often than not you will pay what they ask. You can’t wait any longer to go through this whole process again. You just want to get in your car, go on your way, and put this whole bad event behind you. Your frustration and eagerness is what all of these companies count on. That is the essence of this scam. And it works. You WILL PAY. It’s very simple, if this scam did not work, it would not still be going on in every major city, in the United States for the past 40 years. Don’t be the next victim. Want to know the crazy part of this whole scenario? They have done nothing wrong. Yep. Not legally speaking anyway. They stated “…plus labor”. They told you the minimum price that it would be. Once they arrived, they didn’t “force” you to pay, did they? You agreed to the “final” price. It’s not like they opened the car, then changed the price. It’s all nice and legal. But it is just not ethical. The above conversation isn’t even the worst of the worst. Some upper echelon scam companies (the really heartless ones), don’t even quote the “…plus labor” part. They just say “$15 dollars”. Some companies won’t even quote that! If you don’t ask, they don’t volunteer any info on their services – certainly not their scam pricing. They just ask for your address and then they send someone to you. A real locksmith company gives an exact price (all inclusive) whether a client asks them for one or not. It’s just good, ethical business practice. If you do not ask for a price up front, from one of the scam companies – they will trick you. They will cheat you. They quote “$15 to come out plus labor and labor starts at about $10 for a basic lock”. Once they get to you, your “basic” lock will turn out to be a ‘high security’ (this is one of their favorite “excuse phrases”) lock. Their original price will quadruple or worse. They charge you for the new pins along with all the other charges. Replacing the ‘pins’ is what a rekeying job is. It’s like buying a car from a dealer and the dealer charging extra for the steering wheel and the windows. It is always included. It’s a given! The technician gives a different price depending on how many pins are in the lock. Almost every basic lock has five pins. Every locksmith knows this. This is basic common knowledge. They also know that the general public does not know this. They count on this fact. The unscrupulous tech tells you that he can’t “see” how many pins there are in the lock and will have to open it first. He tells you that if it has 4 pins, the charge will be $10 to rekey it (sounds cheap, right?). If the lock has 5 pins it will be $60, and if it has 6 or more it will be $149. At this point you, subconsciously, are praying that it doesn’t have 6 or more. The technician then takes the lock off the door, takes it apart, and states, “Oh, thank goodness, this lock is only a 5 pin lock. You just saved a bunch of money!” You are so glad it wasn’t a 6 or 7 pin lock that you are glad to pay ‘just $60’ plus all the ‘other’ fees. You even thank him for the privilege. The lock(s) are broken and/or the lock has to be repaired first. Nope. Your lock is not broken. It just isn’t. If it worked before they got there – it still works now. Period. Two explanations – They broke the lock on purpose or they just plain lied to get more money out of you. That’s it. It has been previously rekeyed to be “un-pickable”. One of the pins is “stuck”. You’re screwed. What else can you do? You are locked out. You need back in! So….you pay. $149-$349 is what they typically ask for. This practice (unlike some of the other scams) is completely illegal, not to mention unethical and immoral. It is hard for the authorities to prove this. So this scam continues to this day. How can you protect yourself? Simple. Get a price over the phone. 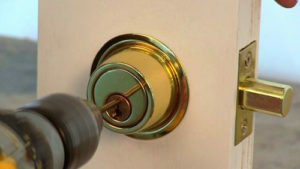 A reputable locksmith company will give you a flat price to pick any lock. If they charge to drill and/or replace a lock – they will give you an upfront price for that too. Most real locksmith companies will not even charge extra to drill and replace a lock (as long as the lock is a standard one). They don’t charge for this because they feel that it is not your fault that the lock is “hard to pick”.